In a few short weeks, students and teachers are heading back to campuses and classrooms. From first day of school outfits to lunchbox staples to classroom activities, there are so many ways to bring Fair Trade back to school – while supporting education in communities around the world. Add Fair Trade to your back to school shopping list! From backpacks to clothing to soccer balls, there are hundreds of Fair Trade products to send you back to school in ethical style. Looking for Fair Trade options for the items on your list? Search products from Fair Trade USA, Fairtrade America, and the Fair Trade Federation. Take it to the next level. Work with your campus bookstore to make the switch to Fair Trade apparel. Check out Alta Gracia for school-specific spirit wear, or find other apparel options from the organizations linked above. Did you know we have resources to help you bring Fair Trade into your classroom? Find dozens of educational videos on our YouTube channel, browse our recommendations for Fair Trade films and books, or check out our list of suggested classroom resources. For middle and high school classrooms, we have lesson plans covering environmental sustainability, gender equity, child labor, and global economics. Not sure where to start? 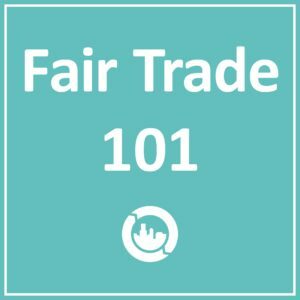 Our Fair Trade 101 guides are a great way to share bite sized facts with your students, classmates, or anyone else! Take it to the next level. 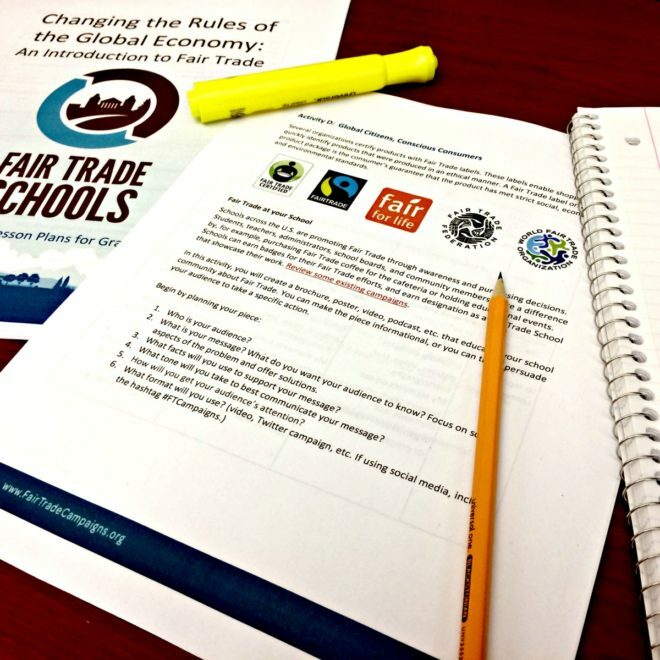 Work with teachers or administrators to incorporate Fair Trade into course syllabi and curriculum. Gain a deeper understanding of Fair Trade topics, and ensure Fair Trade education continues year over year. Coffee for early morning classes. Fruits and vegetables to keep you healthy. Chocolate and ice cream because you deserve it. Whatever fuels your studies, choose Fair Trade! Take it to the next level. In the lead up to National Coffee Day (September 29), we’re joining Fair Trade USA to celebrate the impact of #JustOneCup of Fair Trade coffee. 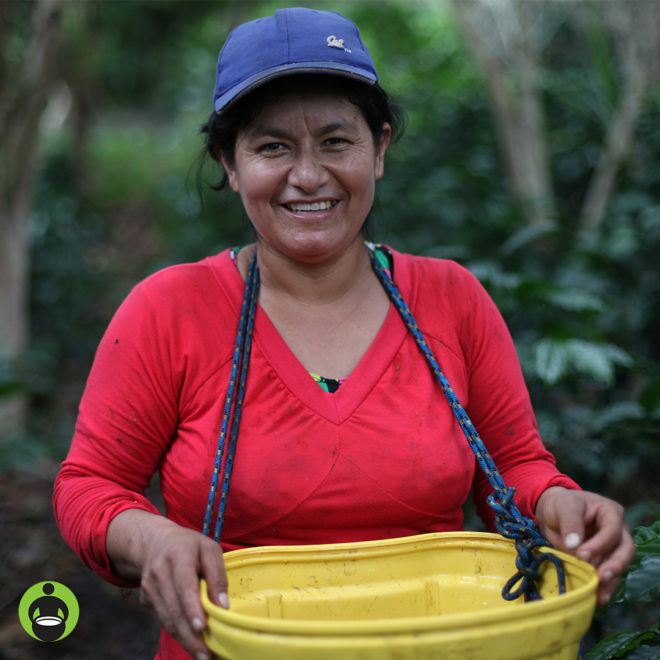 Choose Fair Trade coffee, and help us make a difference for coffee farmers around the world! Challenge your campus to to make the switch to Fair Trade coffee. Host a Fair Trade coffee hour or film screening. Tell us how Fair Trade coffee fuels your day by posting on social with #JustOneCup. Find more information and resources – including graphics for social and Chemex brewing tutorial! – right here. The start of the school year is a perfect time to re-energize your campaign, recruit new members, and start working towards new goals. Participating in a club fair, new student orientation, or other back to school activities is a great way to raise awareness about Fair Trade at your school and recruit new members for your Fair Trade committee. Get your new team together for a meeting to set goals for the coming year, or start planning a fall event. Or make plans to take part in Fair Trade Campaigns’ Fair Trade Month and Fair Trade Finals programs! Whether your school has been declared for years or you’re just getting started, we have the tools you need to make this the best year yet for your Fair Trade campaign. 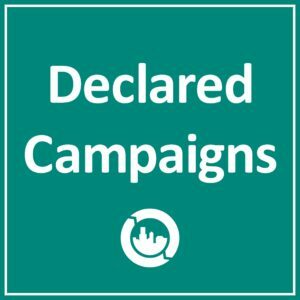 Get started with our roundup of key resources for each campaign types, stay active with our guide to long-term impact, or browse the full collection of toolkits and guides in our Resource Library. Have questions? Looking for more ideas, tools, or other support for your campaign?